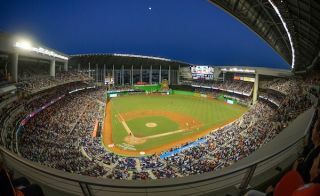 The Miami Marlins are using Haivision’s Makito HD video encoders to stream live video of the games to fans throughout Marlins Park on more than 700 flat-panel screens in private suites, concourses, clubs and retail shops. Working with Daktronics, a provider of display technology and media control systems for stadiums and venues, the Miami Marlins have deployed Haivision’s Makito encoders to bring real-time video of the game into one of the most sophisticated large screen and IPTV systems in the world. For Daktronics and the Marlins, HD over IP yields significant flexibility in system design and media control. For Miami Marlins fans, the integrated system gives them the confidence to leave their seats, explore the ballpark and visit concessions and retail areas, without missing any key moments of the game. With extremely low latency, highly efficient H.264 video compression, and 1080p60 video quality, Haivision’s Makito HD encoders are designed for IPTV and HD digital signage, providing real-time live action with imperceptible delay. The Marlins can now show the game from different angles on the field, display video from other games in progress, and include any other type of dynamic audio and video content to entertain the crowd.